Why you need chiropractic wellness care and I mean everyone! A well-referenced paper presented at the 10th Annual Vertebral Subluxation Research Conference in Hayward, California explains why your chiropractor suggests that you continue with chiropractic maintenance care, sometimes called wellness care, after your initial spinal problems have been corrected. Maintenance care is having your spine checked for misalignments called vertebral subluxations even when there are no specific complaints. These visits are used to maintain proper function and improve health. Since we are all on a continuum of health and are healthy at one end and sick are deceased at the other it is important to maintain continued care all through life. this can also be refered to as spinal hygiene. It is similar to oral hygiene but what is more important white teeth or an intact central nervous system. Everyone young and old needs a chiropractor! These are two concepts that, if understood, offer a good rationale for chiropractic maintenance care. The first is the concept of Immobilization Degeneration which is decreased segmental movement over time. One of the primary components of the vertebral subluxation complex is decreased movement of the vertebral joint. Forty years of research tells us that when a joint loses normal movement, Immobilization Degeneration begins to occur at a measurable rate within one week. This is why coming in when it hurts or two or three times a year many not be frequent enough or it may be to late, the damage may already be done. The second concept that needs to be under stood is how a subluxation can exist in a patient without any symptoms. When a subluxation occurs, the misalignment of the joint oftentimes does not produce pain, for a long enough period of time to get through to the areas of the brain responsible for pain detection. It is also know that the brain filters out pain and only responds to it when the body can no longer adapt. So when you feel the pain it has been months to years before you start to seek treatment in many cases. Again this is often to late for a full recovery. Two good reasons for lifetime chiropractic maintenance or wellness care are presented here. One, degeneration from a subluxation begins to appear within one week. How long do you want to wait to get it corrected? Two, many times patients do not feel pain immediately when a subluxation occurs much like you don’t feel immediate pain from a cavity in a tooth. Pain may not show up until the degeneration causes a large amount of damage. Again, how long do you want to wait? This is why I like to introduce the concept of spinal hygiene. It is important to see a chiropractor and visit them at lest once every month if not mor frequent. It is often less costly than you think and just imagine what the deductible could be on that low back surgery. It is also important to note that all of the organ systems are controlled through the central nervous system and if the spine deteriorates it will have adverse effects on the heart, lungs, digestive tract, kidneys and much more. 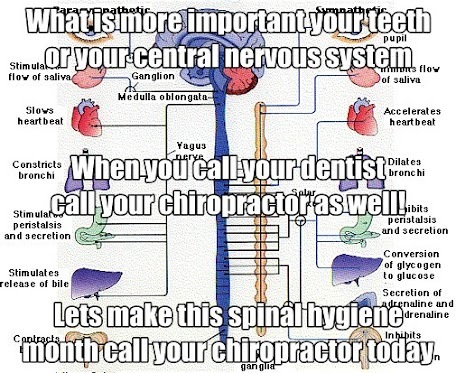 Chiropractic maintenance and spinal hygiene may just save your life. Sure it is not an episodes of ER but if something that is injured 10 years earlier can compromise heart function later in life it is no less life threatening just lest immediate.